You don’t have to start a business from scratch to be an entrepreneur. In fact, buying a business might be a better decision. Creating, selling, and buying businesses are all part of the entrepreneur’s journey. After starting one business from scratch and selling it, I bought a business that already had revenue, scaled it, and sold it. Then, I started Hubstaff in 2013. Our growth caught the attention of investors and we’ve talked to several VC’s, but we opted to bootstrap the company instead. We’ve wanted to grow by getting into related markets, but we didn’t have the bandwidth to start an initiative from scratch. Because of this constraint, we decided to make our first software acquisition. What follows are the lessons I’ve learned from 12 years (and counting) of entrepreneurial experience from buying, selling, and creating businesses. I’ll explain how we applied that knowledge to make our first acquisition and how you can also grow your business through an acquisition. While, there are various benefits to both buying and building a company, it all comes down to what you’re willing to sacrifice in your entrepreneurial journey. If you build a startup from scratch you get creative control and the experience of building something from nothing. The trade-off is that it’s a slow, painful, and expensive process. You have to iterate and learn as you go and learning is expensive. We’ve invested close to $600,000 in Hubstaff so far which doesn’t include founders’ time. That’s cash that could have gone into our pockets. It took three years for Hubstaff to get solid traction and each day is still a battle. While creative control is great, it comes with extra work and requires extra patience. If you buy a company, you’ll sacrifice the original creative control and the founder’s experience but you can get a revenue stream faster. You can literally become the owner of a million-dollar income stream overnight if you can pay for it. Compared to building, buying a company is less risky because you’re the business has already been proven to generate paying customers. One of the reasons for buying an existing business is because it’s cheaper. It sounds counter-intuitive because of the upfront cost, but if you buy the business at up to three times the net profit, you’re getting a great deal in both time and money. You’re buying the email list, the code, the brand, and so on which already make money. Imagine the investment it would take to build all of that from scratch. For example, with my golf business, we made over 25 DVDs and paid about $10,000 to produce each one. That’s over $250,000 spent and it took about $1 million to build the email list. But we didn’t sell the company for nearly that price because we had already depleted most of the value from those assets. We had already promoted to the email list a ton and launched all the products. The person who bought the business didn’t have new products to sell or new customers to sell to so the business was worth less. A word of caution when buying an existing business: people always sell a business for a reason and they might not be completely honest about it. If the business is truly fulfilling and bringing in money on autopilot, would they really want to sell? To understand how I built Hubstaff, it’s important to know where I began. In 2004, I had a salaried job that paid me $50,000. That’s when I started my first business selling instructional golf DVDs and books for $47 each. That’s nearly 20 times the number of units it would take to replace my income. That’s when I realized recurring revenue is crucial to building a million-dollar business. It’s a key factor in creating a business that scales. If you sell units manually like I did, you have to fight for every single transaction every day to meet your daily quota. That repeatable transaction is what enables you to spend your time growing the business instead of fighting for the next sale. Recurring revenue doesn’t only apply to the software industry. It can be insurance renewals, warehouse space rentals, information membership sites, and anything else you can bill on a monthly basis. This realization about recurring revenue led me to another epiphany: recurring revenue businesses are worth more than pay-per-unit businesses. When exiting any business, you sell the assets – the email list, domain, code, infrastructure, goodwill – but for a recurring revenue business, you’re also selling the subscriptions. If I were to go back and do my first business all over again, I would’ve found a way to make it into a recurring revenue model. 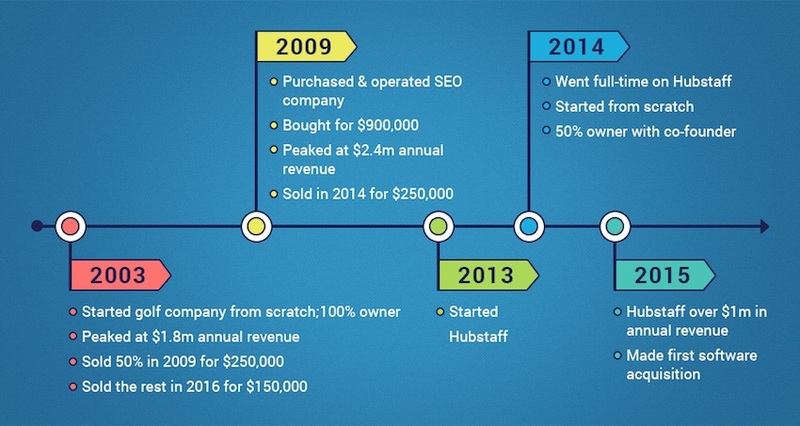 Hubstaff was my first recurring revenue business and I’ve never looked back. While recurring revenue is a big factor that allows a company to scale, it doesn’t mean that the company will become a unicorn. The first – and biggest – mistake an entrepreneur can make is aiming to become the next billion-dollar unicorn. It’s enticing, but looking at the data below, more than 70% of businesses make less than $1 million annually. While the data is from 2004, it’s unlikely the numbers have shifted dramatically. There are currently 174 unicorn companies in the United States. In 2010, there were 27.9 million small businesses. Now, let’s say you end up creating a business that lasts more than five years. According to the numbers above, there’s a 0.00062% chance that you’d become a unicorn. Whether I’m building or buying a company, I aim to do $1-10 million in annual revenue because it’s more realistic. I don’t want a trillion-dollar company. I don’t want a business with 400 employees reporting to an office. I want to lead a lifestyle business that provides me with enjoyment and freedom. I want a business working for me and a team that I like. Those things are more important to me than becoming a billion-dollar business. To illustrate this point, I’ll use Buffer as an example. They’ve done an amazing job building an all-star team and a valuable company. They currently bring in $9.51 million in annual recurring revenue. They’re not at $1 billion. They’re not at $100 million. And they’re fine with that. The founders, Joel and Leo, are happy doing what they do. I try to replicate Buffer more than I would Uber, Airbnb, or Facebook. It’s more realistic and provides me with the lifestyle I want. An entrepreneur invests time and money and energy into their business and themselves. It’s important to do something you understand that will provide value to people instead of trying to become a unicorn. This isn’t to say it’s bad to have big goals and large ambitions. I support ambition – I wouldn’t be where I am without it. But rather, it’s important to focus on the small wins before trying to become the next big thing. I like to think of entrepreneurship like baseball: Don’t try to hit a homerun if you haven’t hit a single yet. Focus on hitting the singles. That’s how you’re going to win. A common misbelief entrepreneurs have is thinking the business they start will be around forever. According to the U.S. Bureau of Labor Statistics, about 50% of companies will survive (raw data) more than five years. The golf business I started in 2004 brought in $1 million in annual revenue for six years. After that, competitors came in, advertising rates increased by 300%, conversion rates dropped, Google changed their advertising rules, and so on. We had built a database of over 500,000 golfers, but they stopped buying as much. The cost of buying traffic went up 20-fold which made it extremely difficult to acquire new customers profitably. The business model no longer worked. The SEO company I bought made over $1 million in annual revenue for five years. We primarily sold to SEO agencies and most of them went under after Google’s algorithm changes in 2011-2013. Their clients were scared and slashed their SEO budgets. About 60% of our clients went out of business and the other businesses changed their strategies. The market and environment change quickly; pay attention and prepare for it. It’s important to understand and accept that a business might only have a few years of really good revenue. When you have those good years, know that you may need to bank some of it so you have the ability to move on. Otherwise, you might end up trying to make a failing business work. For example, I banked some cash from those two companies which allowed me to go three years without an income to build Hubstaff. That’s because I didn’t continue trying to grow a business that no longer made sense. I accepted that things were changing and I prepared for it. I took the cash, put it in the bank, and lived on that while building my next thing. I’ve mentioned it before, but selling two businesses and buying one taught me a big lesson: lose your ego. Many entrepreneurs believe their business is worth more than it actually is. I’ve met entrepreneurs who felt that their businesses were worth $20 million when they had $10,000 in monthly recurring revenue. Unless you’re acquiring users or growing revenue at an accelerated rate, your business is probably worth about three times your cash flow. 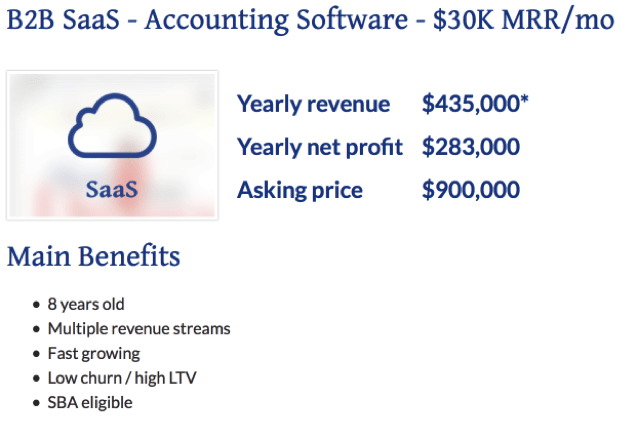 Below is an example for evaluating an accounting software business from David Newell, a broker at FE International. You can see that it’s a SaaS company in a stable industry with a net profit of $283,000 and the asking price is $900,000 (which will likely be negotiated down during the selling process). When selling your business, keep in mind that buyers are more willing to pay for profits – not assets. It doesn’t matter if you spend $500,000 or $20 million to build software. If you can’t get any paying users, your business isn’t worth anything. Since we’re talking about growing a business through acquisition, I’m going to focus on the buyer’s point of view. If you plan on buying a company, try to get seller financing and negotiate to pay for only a portion of the business up front. This lowers the amount of money you need to raise. Then, you can use the recurring revenue from your new business to pay the rest of the debt over time. You can increase the chances of a seller wanting to work with you if you demonstrate your experience and convince them that you have the skills to keep the business alive and grow it. This gives them confidence that they’ll be paid in full. It’s clear that seller financing favors the buyer. In some cases, sellers provide financing to a buyer but don’t receive all the payments because the buyer wasn’t able to keep the business alive. This is why it’s difficult to get seller financing. If you can negotiate for seller financing, be completely honest about your ability to grow the business and pay off the seller. Selling a business isn’t as simple as putting your company on the market and getting a buyer. You have to get everything lined up. You’ve got to find the right buyer, sell them on the idea that they can grow the business, have all your documents in order, know your numbers inside out, and make sure your product is ready to be acquired. These things must all be given their due diligence and every detail must be thoroughly reviewed. I had to drastically lower the price on the two businesses I sold just to close the deal. Both businesses were on the market for over a year and we had to make massive employee cuts to keep the profit levels steady. In retrospect, I waited too long to sell the businesses. I should’ve started looking for a buyer when the business was still growing. Again, sell while your business is growing, not at the tail end of its success. From my experiences, I’ve come up with what an ideal scenario would look like for me if I were looking to purchase another business. I hope this will give you an idea of what you should consider before buying a business, what the purchasing process looks like and help you think through your purchasing decision. These are likely the people closest to you who know your background and experience and trust your ability to grow a company. They shouldn’t be concerned about what type of business you’re going to buy. They should be investing in you and know that whatever company you buy, you’ll be able to grow successfully. Remember, the value of a company is about three times its cash flow. Try to buy a business for less than that so you can pay off the financing quickly. At the time of purchase, the SEO company I bought was doing $500,000 in annual profit and growing. It was valued at about $1.5 million but I bought it for $900,000. It was a great deal that allowed me to pay back investors and focus on profit much more quickly. When you have the purchasing discussion with the seller, negotiate for seller financing by leveraging your experience. This will build trust so they believe that you’re able to grow the business and pay it off. You can even propose a higher price in exchange for seller financing and include a discount for early payoff in the contract. Justify extra fundraising by creating a plan for how you’ll use the money to invest in the business and improve marketing and operations. You can also use the money to pay the seller and get the early payoff discount. Once you’ve bought the business, you’ll start making money from the get-go. Use that profit to make the monthly payments. As you continue to grow and improve the business, you’ll be able to make larger payments and get the early payoff discount. When you first take on a new company, you may have savings from a previous job or your previous company so you may not need to take a salary initially. In the beginning, this is a good decision because you want to pay off your debt quickly. However, your savings probably won’t last forever, and you should make sure to have some money in the bank in case anything undesirable were to happen to this new company. 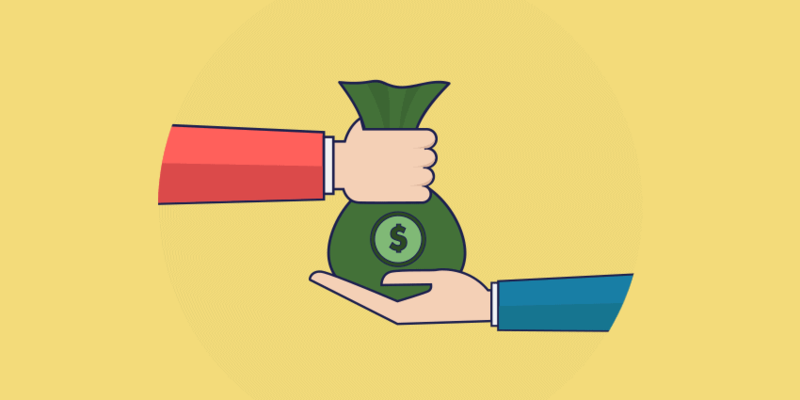 Take a salary so you can sustain your efforts in growing your new company. I took a $120,000 salary when I was growing the SEO company. This will need to be planned out before you make the purchase. The business likely had something wrong with it – that’s probably why they sold it in the first place – it might be low conversion rates, a buggy product, expensive customer acquisition costs, and so on. Anything you can do to improve these shortcomings means more profit. The business may have been spending a ton of money on a support team, developers, writers, and so on. Reduce overhead by using your own team or other resources you have. Maybe the previous owner was spending money on unprofitable ads or spending $20,000 a month on services that weren’t showing a good return on investment. I’ve made many of these reductions and increased monthly profit by thousands of dollars. It’s reasonable and expected that it will take you a few years to pay your investors back. Lay out a plan for what the monthly payments to them will be and make it easy for them to understand. If you plan to pay them off early, let them know that you plan on completing your payments early which means you would only pay a portion of the total interest that would accrue if you were to pay according to the schedule. They might not expect this so it’s important to communicate your plans and make sure your investors are on the same page as you when it comes to money. After all of the above, you will have bought a business, cut expenses, grew revenue, received a nice salary, you would own at least 50% of a good-sized business, and your investors would be happy. Your business may get to the point when you’ve got the playbook figure out and you have the machine running and you’re scaling, and you want to add a new aspect to the business to grow it even further. That’s where we found ourselves, but we couldn’t allocate any resources to develop a new initiative from scratch, so we decided that an acquisition would be our best bet. A blog. This could have been a new channel for traffic. A freelance marketplace. We purchased a job board, Talentopoly, instead. The decision would expand the revenue of the parent company. The plan could be executed using only our current marketing and development team. If software, the product would have to be built on Ruby on Rails. We were open to doing anything within those constraints. For example, we could have acquired an accounting software business with similar customers to Hubstaff which would have given us (1) another product to drive revenue and (2) a new group of customers already paying for a product. As fate would have it, in September 2015, we interviewed a developer who mentioned he had created a project management suite, and he was going to shut it down to start a new project. It was a Kanban style suite that included time tracking. Hubstaff already uses Kanban for internal project management. It was clearly a perfect match. We asked if he would consider selling us the software since he was going to shut it down. We agreed on a deal to purchase the software and have him join our team to continue working on it until it was ready to be released. This was a win-win for both parties. In our case, an acquisition made sense with our limited resources and the process was extremely easy because we happened to interview someone with software that fit perfectly with Hubstaff. Most of the time, acquiring a company will take a lot of time and money and, as mentioned in my ideal scenario, and there may be many stakeholders involved. Whether you decide to build or buy a business, make it easy to scale by baking in a recurring revenue model. Instead of trying to build a unicorn, focus on hitting the singles and aim for $1-10 million in revenue before swinging for a home run. Keep those two things in mind and you’ll be well on your way to building a profitable business that provides value to people and allows you to live a life you want. Have you bought or sold companies or thinking of doing either of those? Share your thoughts, experiences, and questions in the comments below.